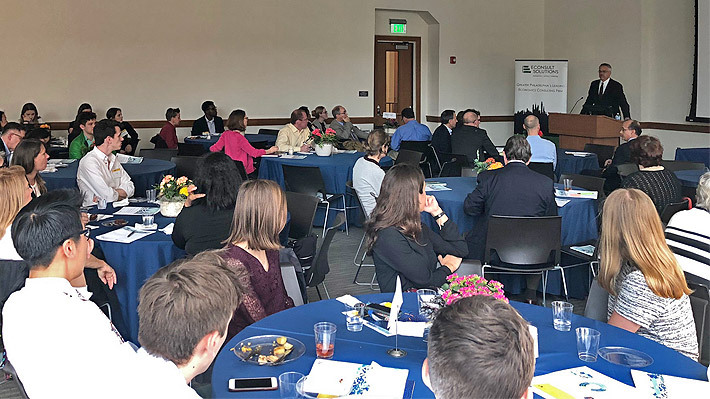 Drexel’s School of Economics and Econsult Solutions presented the 4th Annual Urban Economic Policy Conference on April 13 at Drexel University. The focus of the conference was topics in education. Susan Dynarski, PhD, professor of public policy, education and economics at the University of Michigan, delivered the keynote. Her research focuses on the effectiveness of charter schools, the optimal design of financial aid, and the effect of high school reforms on academic achievement and educational attainment, and other related issues. Dynarski spoke about how income levels relate to test scores among grade school and high school students, as well as how it affects college attendance and graduation rates. “Most low-income families don’t realize that lower-cost education options are available, or how much financial aid is available to them,” she said. “In other words, they are overestimating the cost of getting an education for their children.” She says that the complicated nature of understanding and applying for federal aid exacerbates the issue. Two panel discussions followed the keynote. A panel on education policy, K - 12, was moderated by Stephen P. Mullin, president of Econsult Solutions Inc. The panelists included Sarah A. Cordes, Assistant Professor, Policy, Organizational, & Leadership Studies, Temple University; Loree D. Jones, Chief of Staff, Rutgers University-Camden; and Leroy D. Nunery II, EdD, Founder and Principal, PlusUltre LLC and Senior Advisor, Econsult Solutions Inc.
A panel on higher education and implications for the urban workforce was moderated by Christopher Laincz, PhD, Director of Drexel LeBow’s PhD Program and Associate Professor, Economics. Panelists included Paul Harrington, PhD, Professor, Higher Education, Drexel University’s School of Education; David A. Paul, EdD, Managing Director, Fiscal Strategies Group, Inc.; and Judith Gay, PhD, Vice President for Academic Affairs, Community College of Philadelphia. The sold-out conference was attended by economists from academia and industry, as well as approximately 35 students who study economics at Conestoga High School, in Chester County, Pa. Opening remarks were made by Vibhas Madan, director of the School of Economics, and Paul Jensen, the newly appointed dean of LeBow College of Business. Drexel LeBow’s School of Economics partnered with Econsult Solutions for the first annual joint conference on urban economic policy. Drexel’s Office of the Provost recognized Yoto Yotov, Chris Finnin and Frank Linnehan in the areas of teaching, scholarship and professional service. As a corporate partner, ESI will contribute to Drexel’s tradition of experiential learning, academic excellence and participation in real-world problem solving.